It's weird it took me so long to get to this series. 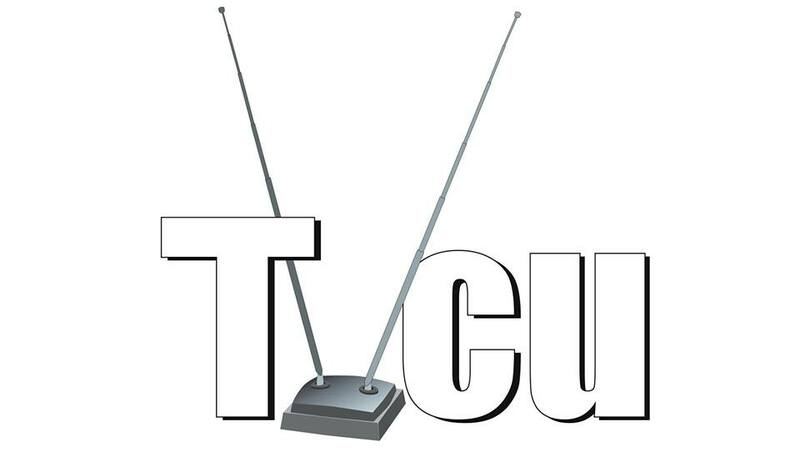 It's actually pretty significant to the TVCU. First off, I often blame Hiro Nakamura for any continuity errors and changing canon within the main TVCU timeline. He messes up the timeline a lot, and so it's only natural to blame him. Second, I often site Heroes as an example of how super-heroes exist within the TVCU. They usually operate in secret. Another is the fact that there is a guy who writes comics about the characters in the show, and the guy writing the comics is a character in the show. This helps explain other instances when a series is demonstrated to exist in the TVCU and also seems to be a fictional series in the TVCU. This show also had a lot of cool crossovers. One of us, one of them. 2589 B.C. to September 20, 2006--Click here for a detailed timeline of the events related to HEROES that happened prior the the eclipse in the pilot episode of HEROES. 1990 to 2000--BEVERLY HILLS 90201--The red box Morley pack design first appeared on Beverly Hills 90210. 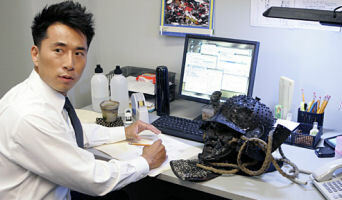 Since The X-Files became part of popular culture, Morley is used to create crossovers by enthusiasts. Click here for more Morley appearances. January - February 1999--BATMAN/HELLBOY/STARMAN (DC AND DARK HORSE COMICS)--Crosses: Lovecraft’s Cthulhu Mythos. Batman, Hellboy, and Starman must team up against a Neo-Nazi cult trying to raise a Lovecraftian Elder God. Anything that crosses with Lovecraft gets solidly placed in the Television Crossover Universe. Because of this, the Hellboy comics and movies are in the Television Crossover Universe. This Batman should be Bruce Wayne Junior for Television Crossover Universe purposes. He’s a bit more grim and gritty than his father in the role. (Ironically, BJ was also the 1960s Robin, who was pretty lighthearted and full of bad puns. But an incident with the Joker as told in John Byrne’s Generations explains his new attitude.) This also brings in the modern age Jack Knight Starman series. Interestingly, that Starman series by James Robinson kept the same writer throughout and had a beginning and an ending. And though it took place in the DC Universe, which operated under the comic book time where the entire 75 plus years of DC Comics stories happened in the past 5 - 12 years only, the internal Starman timeline had time moving at the same pace as the real world. Jack’s annual visits with his deceased brother happened annually. The Starman series tied into the entire Starman legacy, as well as Phantom Lady, the Shade, the Black Pirate, and the golden age Justice Society of America. I have no problem with bringing in the JSA and these other characters, keeping in mind that that doesn’t mean that every single appearance is canon in the Television Crossover Universe. Basically, the rule for DC and Marvel super-heroes is that if they get included due to a crossover with a television or film series, then only their first appearance and/or origin story gets in as canon, and then whatever stories show up in the Television Crossover Universe (within the book posts and/or the chronologies of this book). The DC and Marvel Universes have very complex mythos regarding their superheroes that don’t work in the Television Crossover Universe. However, they can exist if they had very limited adventures, only operating occasionally, and mostly in secret and out of the public eye. On the other hand, with super-heroes who are created for television or film, such as Buffy the Vampire Slayer, Heroes, the Six-Million Dollar Man, or Automan, I have no problem including all of their stories that didn’t involve crossovers with other characters, and crossovers with other television and film characters. While Starman is not a television or film character, I feel because of the nature of how his story is told, this story can bring in the entire Jack Knight storyline as told by James Robinson, but not all DC Starman stories. 2003 to 2008--LAS VEGAS--Characters from HEROES stay at the Montecito, the hotel and casino featured in the series LAS VEGAS. The Montecito Resort and Casino is a fake hotel and casino featured in Las Vegas. 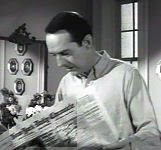 Other NBC series used The Montecito. December 2004--LOST--"Raised by Another"--Lost Raised by Another was the first appearance of Gannon Car Rentals. It has since appeared on Nip/Tuck Conor McMamara, 2026 , Heroes The Fix , and Glee The New Rachel . 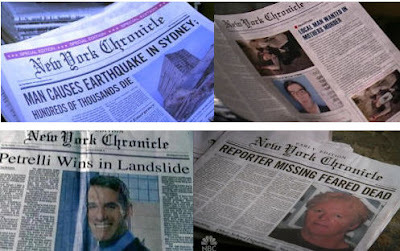 2006 to 2010--HEROES--The New York Chronicle appears in the series, a newspaper that traces back to THE PATTI DUKE SHOW. 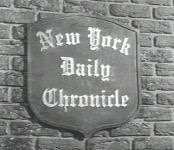 Click here for more on the Chronicle. Spring 2006--HEROES--"How Do You Stop an Exploding Man?" --Ted Sprague buys a gun from Walter Sobchak from THE BIG LEBOWSKI!!! 2007--Takezo Kensei: Sword Saint--This is a web-based spinoff of the television series Heroes. 2008--HEROES: HARD KNOX--This web series chronicles Matt's attempt to convince a street thug, Knox, to turn his life around. 2008--HEROES: THE RECRUIT--The events of super-soldier Rachel Mills's survival after the Pinehearst explosion are documented in this web series. 2008--HEROES: GOING POSTAL--This web series details the events of the hero, Echo, who is on the run from "The Company". May 2009--SCRUBS--"My Finale"--The writes of Scrubs had intended for Franklyn the lab tech to return for the finale, where it would be revealed that he was apparently really a post-HEROES Hiro Nakamura all along, which, as a time traveler, is completely possible. However, for some reason, NBC wasn't having it. Summer 2010--Connor and I rent a Nissan Versa in San Diego, you know, just like Hiro and Ando, as seen in the Eighth Wonders comic book, because we're basically just like them. Clearly this places us in the same universe as HEROES. 2012 to 2013--TOUCH--In the first episode of this Tim Kring series (the same guy who created Heroes), a Japanese girl asks, "You know Ando's brother, Takezo?" December 2015 to Present--The TELEVISION CROSSOVER UNIVERSE PODCAST--This show has many, many sponsors, including Gannon Rental Cars, Slusho, and the Montecito, which obviously means that the TVCU Crew (Robert E. Wronski, Jr., Crazy Ivan Ronald Schablotski, James Bojaciuk, and Chris Nigro) are HEROES. Also, it seems the rumors of James Bojaciuk's death within the Television Crossover Universe may have been greatly exaggerated. Futures that existed until they were averted: Click Here. 2010 to 2015--Click here to find out what happened between HEROES and HEROES REBORN. 2015--HEROES REBORN: DARK MATTERS--Five years after the public became aware of the existence of evolved humans - or "EVOs." Said public is not entirely supportive of these EVOs. In fact, few people fall into the middle ground. 2015 to Present--HEROES REBORN--A year ago, a terrorist attack in Odessa, Texas, left the city decimated. Blamed for the tragic event, those with extraordinary abilities are in hiding or on the run from those with nefarious motives. This series takes place in an alternate timeline where super-powered beings are public, which sorta-kinda matches up with other shows I've placed in the TVCU2 timeline. 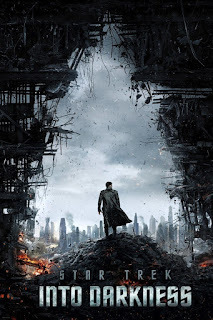 2387--STAR TREK--Romulus is destroyed, and a villain blames Spock. He chases Spock into the past, but they are shifted to an alternate reality, which I call the TVCU2. This would be the home reality of remakes of original TVCU events. This is the home, for instance, of the remake of A NIGHTMARE ON ELM STREET. So there was not altering of time. They simply shifted to the past of another reality where they were meant to go. The villain appears first, in 2233, where he causes the death of Kirk's father. Note this film has the drink called Slusho, which has also appeared in ALIAS, HEROES, FRINGE, and CLOVERFIELD. Obviously the drink exists in both realities. Those three shows likely happened in both universes. CLOVERFIELD did not happen in the TVCU, but likely did happen in TVCU2. Slusho is also seen in the sequel, STAR TREK: INTO DARKNESS. ROBOT CHICKEN UNIVERSE--Of course, an alternate version of HEROES exists here. This universe is demonstrated to exist as a separate reality in the multiverse by Family Guy: Road to the Multiverse. WRONSKIVERSE--The events of the past of Heroes also took place in the Wronskiverse up t o 1979, after which, events greatly diverged with the public debut of Super-Bob. The project that originally was studying those teens who would become the founders of the Company was Project: Franklin.